I’m going to be up in your business in July! WHO: Pat Bereskin of Bettendorf, Matt Moyer of Columbia, MO, and Robert Reeves of Des Moines. Quad City Arts Art @ the Airport presents artwork by Pat Bereskin, Matt Moyer and Robert Reeves for the months of July and August 2018. Pat Bereskin of Bettendorf is a prolific painter, as well as a dedicated teacher and world traveler. Her latest series, “City Lights,” gives a unique view of the architecture of popular cities she has traveled, including New York, Chicago, Paris and the Quad Cities. 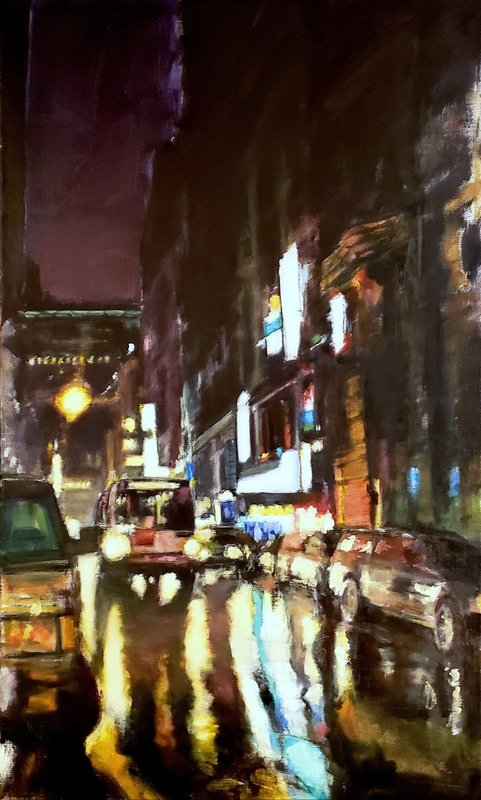 Her paintings depict city lights and the way light plays on the architectural structures. Viewers will sense the vibrations, sounds and grittiness of the city when they ponder Bereskin’s paintings. Robert Reeves of Des Moines also depicts scenes of urban life. His oil paintings portray specific moments in time during the daily life of average city dwelling Americans. Drawing from his surroundings and using architectural and figurative themes as a backdrop he employs his understanding color and perspective to render everyday locations and objects from his unique point of view; Seeking to draw the viewer into a setting and illicit a personal re-examination of the familiar. Matt Moyer of Columbia, MO. (formally from Moline) presents abstract, welded steel sculptures that represent self-contained mechanical systems. He uses new steel and then works on the surfaces with paints and grinders to achieve the appearance of something old and worn. Moyer’s public sculptures have been around the Quad Cities for years as part of Quad City Arts’ Sculpture program, but his latest sculptures will fit inside the glass cases in the airport gallery and interact with the cityscapes of Bereskin and Reeves. ~ by Robert L Reeves on June 13, 2018.